It's bad enough that an American team won the Stanley cup in game seven, but a Canadian riot in the street after the game is like pouring gasoline on a burning building. "Sore loser" is the worst insult you can hurl at a sports lover. Here's my advice to the handful of idiots from Vancouver that made international news: in the future (after you get out of jail, where I hope you landed) keep your infantile attitude locked up in the privacy of your home. 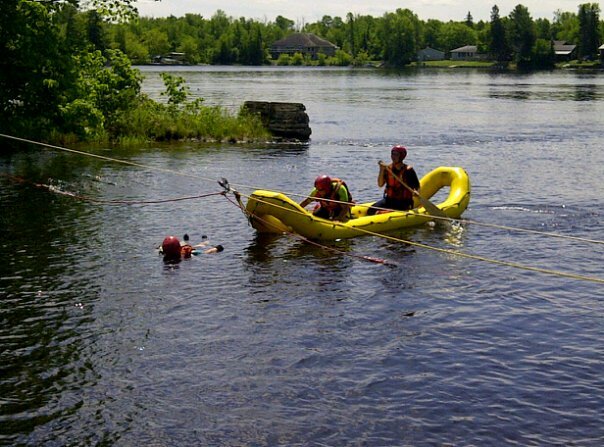 Leaving the badly tarnished Cup, and even more badly tarnished city behind, I'll move on to the good news: I borrowed a smaller wetsuit for the second day of water rescue training in Fort Frances, and was relieved to find that I wasn't as big a wimp as I thought. It was really nice to swim in the Rainy River without becoming hypothermic. 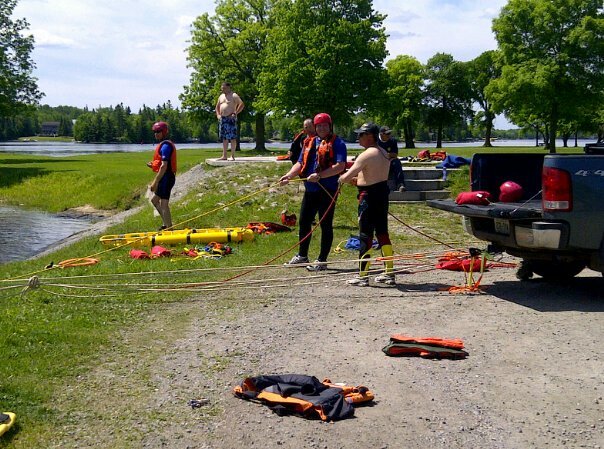 I'm still combatting my one-eyed phone, so I can't show you the photos I took of the training, but I did borrow a couple of pictures from Fort Frances firefighter Bob Whitburn's Facebook page. The first one is the Fortuna connected to a moveable control point. This rig would normally be used in faster current, but the conditions that day were not obliging. Here's a shot of the guys on shore working the rigging. The trip home from Fort Frances was uneventful until I arrived in Upsala Sunday to find a line of traffic developing on the east end of the village. In Upsala, a traffic line on Sunday afternoon can only mean one thing: vehicle collision. It turned out to be a triple fatal involving a young couple and a baby. I've extricated lots of living and dead people in fifteen years, but this was my first time to cut the seatbelts off of a baby's car seat. Enough said about that. My biggest concern after the incident was sanity of my crew, and especially the group of young folks that have joined our department. Phillip joined in January, and this was his first major collision. It wasn't my idea of breaking a rookie into the world of vehicle extrication. We kept the younger members on a hose line for fire protection during the worst of it, but no one walked away from that scene unscathed. We invited a CIS team to come out Monday, and my hat is off to these two friends that made the 300 km round trip to help us out of a tight spot. They wouldn't even accept a donation to offset their travel costs. Mike and Merv, thanks. Just thanks. 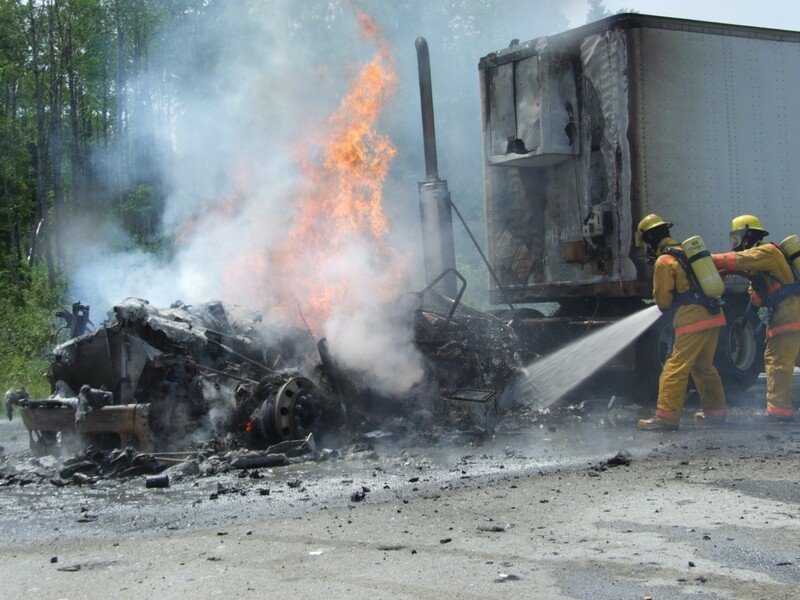 On Wednesday after lunch our pagers went off again, this time for a truck fire east of Upsala. Phillip and I responded with his buddy Matt in the pumper, and in true Upsala style, we were paged about a minute down the highway with an update saying that the call was west, not east. We turned around, and I started to tell the boys to relax, the trucker would probably have put the fire out with an extinguisher already . . . then I looked at the horizon. The fiberglass cab on a tractor trailer makes an impressive smoke plume when it's fully involved. We got another update saying that a fuel tank had exploded and there were reports of injuries. I had a brief flashback to a fiery fatal crash years ago, took a deep breath, and asked the two young fellows next to me if they were prepared for the worst. They said they were, but the doom and gloom reports turned out to be false. 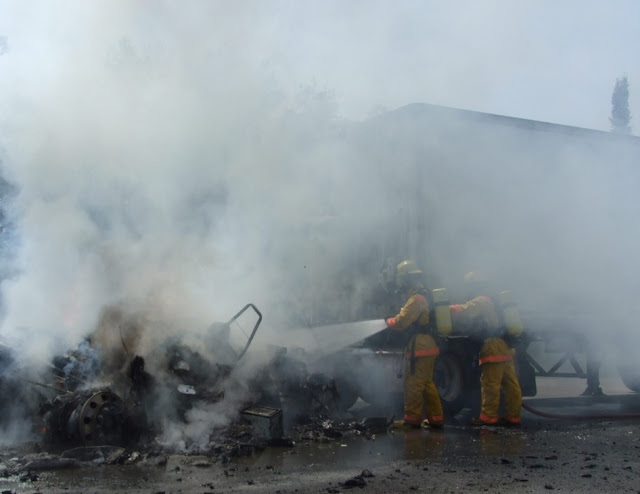 The only thing that died in Upsala on Wednesday was the cab of the truck. The driver was unharmed, and we saved most of the trailer. It's a shame that our small crew can't afford a person on the camera at the beginning when things are exciting, but water on the fire trumps photos for the record. Here are a couple shots taken after things calmed down a little. I hate to admit that while the trucker was having the worst day of her life, we were in therapy. The boys said they felt better having done something "useful" with their training. I reminded them that recovery extrication is a useful service as well, but I had to agree that putting water on fire is much more agreeable than some of the other jobs we do. Of all the happy moments I've spent fishing with my kids, this was definitely a highlight, even though I wasn't there to see him and his buddy Brad nearly sink the boat landing it. And as a bonus, we will eat fish tonight. I still have more to say about Toronto budget cuts, training, and other fascinating topics, but duty calls. My desk is full of unfinished reports. Report writing is the worst way to de-stress, by the way.